This is a video-recording of an online presentation recorded in January of 2007 using state-of-the-art web-conferencing technology and enabling viewers to hear and see Dr. Neufeld in his office in Vancouver, BC. The presentation was enthusiastically received and resulted in a strong demand to make it available for others. Due to some technical problems during the online presentation, the video flutters at times but the audio is strong and the technical problems do not distract from the content. 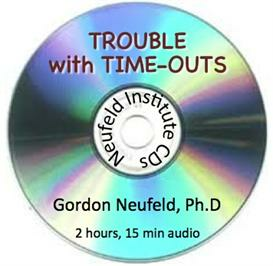 Time-outs - the kind that involves separation from parents - has become a popular practice for dealing with problem behaviour. The issue is not that it works when it does, but why it works and what it costs in the long term. Developmental science is unequivocal in its findings of relationship and emotion being the two most important factors in healthy development. Time-outs, in the way they are typically practiced at least, are injurious to both these factors, wounding children and provoking defensive instincts to back out of attachment and numb vulnerable feelings. Once assumed to be safe practice and still recommended as the discipline of choice by over 80% of today's pediatricians, we must now become conscious of the risks of such discipline. Dr. Neufeld elucidates the trouble with time-outs and points the way to discipline that is attachment-safe and developmentally friendly.